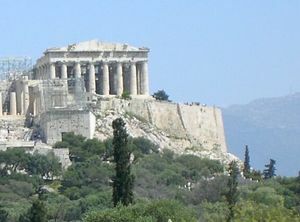 The Parthenon seen from the hill of the Pnyx to the west. The Parthenon (in Greek:(Ο Παρθενώνας) was a temple of Athena, built in the 5th century BC on the acropolis of Athens. It is considered the most famous surviving building of ancient Greece, and has been praised as the finest achievement of Greek architecture. Its decorative sculptures are considered one of the high points of Greek art. The Parthenon is an enduring symbol of Ancient Greece and of Athenian democracy. It is regarded as one of the world's greatest cultural monuments. The name of the Parthenon likely derives from the monumental cult statue of Athena Parthenos housed in the eastern room of the building. This statue was sculpted in ivory and gold by Phidias. Athena's epithet parthenos refers to the goddess's unmarried and virginal status. The Parthenon replaced an older temple of Athena that had been destroyed by the Persians in 480 BC. Like most Greek temples, the Parthenon was used as a treasury, and for a time served as the treasury of the Delian League, which later became the Athenian Empire. In the sixth century AD, the Parthenon was converted into a Christian church dedicated to the Virgin. After the Turkish conquest, it was converted into a mosque. In 1687 a Turkish ammunition dump inside the building was ignited by a Venetian cannonball. The resulting explosion severely damaged the Parthenon and its sculptures. In the 19th century AD, Lord Elgin removed some of the surviving sculptures and took them to England. These sculptures, now known as the Elgin Marbles or Parthenon Marbles, are on display in the British Museum. An ongoing dispute concerns whether the Elgin Marbles should be returned to Greece. The Parthenon, along with the other buildings on the Acropolis, is now one of the most visited archaeological sites in Greece. The Greek Ministry of Culture is currently carrying out a program of restoration and reconstruction. The Parthenon was built at the initiative of Pericles, the leading Athenian politician of the fifth century. It was built under the general supervision of the sculptor Phidias, who also had charge of the sculptural decoration. The architects were Iktinos and Kallikrates. Construction began in 447 BC, and the building was substantially completed by 438, but work on the decorations continued until at least 433. Some of the financial accounts for the Parthenon survive and show that the largest single expense was transporting the stone from Mount Pentelicus, about 16 kilometers from Athens, to the Acropolis. The funds were partly drawn from the treasury of the Delian League, which was moved from the Panhellenic sanctuary at Delos to the Acropolis in 454 BC. Although the nearby Temple of Hephaestus is the most complete surviving example of a Doric order temple, the Parthenon, in its day, was regarded as the finest. The temple, wrote John Julius Norwich, "Enjoys the reputation of being the most perfect Doric temple ever built. Even in antiquity, its architectural refinements were legendary, especially the subtle correspondence between the curvature of the stylobate, the taper of the naos walls and the entasis of the columns." The stylobate is the platform on which the columns stand. It curves upwards slightly for optical reasons. Entasis refers to the slight tapering of the columns as they rise, to counter the optical effect of looking up at the temple. The effect of these subtle curves is to make the temple appear more symmetrical than it actually is. Measured at the top step, the dimensions of the base of the Parthenon are 69.5 meters by 30.9 meters (228.0 x 101.4 ft). The cella was 29.8 meters long by 19.2 meters wide (97.8 x 63.0 ft), with internal Doric colonnades in two tiers, structurally necessary to support the roof. On the exterior, the Doric columns measure 1.9 meters (6.2 ft) in diameter and are 10.4 meters (34.1 ft) high. The corner columns are slightly larger in diameter. The stylobate has an upward curvature towards its centre of 60 millimeters (2.36 in) on the east and west ends, and of 110 millimeters (4.33 in) on the sides. Some of the dimensions form the golden rectangle expressing the golden ratio, praised by Pythagoras in the previous century. The roof was covered with large overlapping marble tiles known as imbrices and tegulae. Detail of the West metopes, illustrating the current condition of the temple in detail after 2,500 years of wars, pollution, erratic conservation, pillage and vandalism. The Parthenon, an octostyle, peripteral Doric temple with Ionic architectural features, housed the chryselephantine statue of Athena Parthenos sculpted by Pheidias and dedicated in 439/438 BC. The temple was dedicated to the Athena at that time, though construction continued until almost the beginning of the Peloponnesian War in 432. By the year 438, the sculptural decoration of the Doric metopes on the frieze above the exterior colonnade, and of the Ionic frieze around the upper portion of the walls of the cella, had been completed. The ninety-two metopes were carved in high relief, a practice employed until then only in treasuries (buildings used to keep votive gifts to the gods). According to the building records, the metope sculptures date to the years 446-440 BC. Their design is attributed to the sculptor Kalamis. 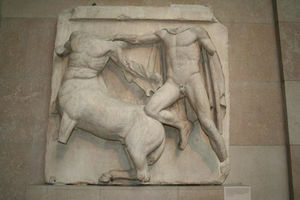 The metopes of the east side of the Parthenon, above the main entrance, depict the Gigantomachy (mythical battles between the Olympian gods and the Giants). The metopes of the west end show Amazonomachy (mythical battle of the Athenians against the Amazons). The metopes of the south side—with the exception of the somewhat problematic metopes 13-20, now lost—show the Thessalian Centauromachy (battle of the Lapiths aided by Theseus against the half-man, half-horse Centaurs). On the north side of the Parthenon the metopes are poorly preserved, but the subject seems to be the sack of Troy. Stylistically, the metopes present surviving traces of the Severe Style in the anatomy of the figures' heads, in the limitation of the corporal movements to the contours and not to the muscles, and in the presence of pronounced veins in the figures of the Centauromachy. Several of the metopes still remain on the building, but with the exception of those on the northern side, they are severely damaged. Some of them are located at the Acropolis Museum, others are in the British Museum and one can be seen at the Louvre Museum. The most characteristic feature in the architecture and decoration of the temple is the Ionic frieze running around the exterior walls of the cella. Carved in bas-relief, it most likely depicts an idealized version of the Panathenaic procession from the Dipylon Gate in the Kerameikos to the Acropolis. In this procession held every 4 years, Athenians and foreigners were participating to honour the goddess Athena offering sacrifices and a new peplos (dress woven by selected noble Athenian girls called ergastines). The entire frieze was carved in situ and it is dated in 442-438 BC. Pausanias, the 2nd century traveller, when he visited the Acropolis and saw the Parthenon, briefly described only the pediments of the temple. The East pediment narrates the birth of Athena from the head of her father, Zeus, whereas the West pediment presents the dispute of Athena and Poseidon over the city of Athens. The work on the pediments lasted from 438 to 432 BC. The richness of the Parthenon's frieze and metrope decoration is in agreement with the function of the temple as an Atheanian Treasury. In the opisthodomus (the back room of the cella) were stored the monetary contributions of the Delian Alliance of which Athens was the leading member. Architecturally, the Parthenon is clearly a temple, formerly containing the famous cult image of Athena by Phidias and the treasury of votive offerings. Since actual Greek sacrifices always took place at an altar invariably under an open sky, as was in keeping with their religious practices, the Parthenon does not suit some definitions of "temple," as no evidence of an altar has been discovered. Thus, some scholars have argued that the Parthenon was only ever used as a treasury. While this opinion was first formed late in the 19th century, it has gained strength in recent years. The majority of scholarly opinion still sees the building in the terms Walter Burkert described for the Greek sanctuary, consisting of temenos, altar and temple with cult image. The Parthenon survived as a temple to Athena for close to a thousand years. It was certainly still intact in the 4th century AD, by which time it was already as old as Notre Dame Cathedral in Paris is now, and far older than St. Peter's Basilica in Rome. But by that time Athens had been reduced to a provincial city of the Roman Empire, albeit one with a glorious past. Sometime in the 5th century AD, the great cult image of Athena was looted by one of the Emperors, and taken to Constantinople, where it was later destroyed, possibly during the sack of the city during the Fourth Crusade in 1204 AD. Shortly after this, the Parthenon was converted to a Christian church. In Byzantine times it became the Church of the Parthena Maria (Virgin Mary), or the Church of the Theotokos ( Mother of God). At the time of the Latin Empire it became for about 250 years a Roman Catholic Church of Our Lady. The conversion of the temple to a church involved removing the internal columns and some of the walls of the cella, and the creation of an apse at the eastern end. This inevitably led to the removal and dispersal of some of the sculptures. Those depicting gods were either possibly re-interpreted according to a Christian theme, or removed and destroyed. In 1456, Athens fell to the Ottomans, and the Parthenon was converted again, into a mosque. Contrary to subsequent misconception, the Ottomans were generally respectful of ancient monuments in their territories, and did not willfully destroy the antiquities of Athens, though they had no actual programme to protect them. However in times of war they were willing to demolish them to provide materials for walls and fortifications. A minaret was added to the Parthenon and its base and stairway are still functional, leading up as high as the architrave and hence invisible from the outside; but otherwise the building was not damaged further. European visitors in the 17th century, as well as some representations of the Acropolis hill testified that the building was largely intact. In 1687, the Parthenon suffered its greatest blow when the Venetians under Francesco Morosini attacked Athens, and the Ottomans fortified the Acropolis and used the building as a gunpowder magazine. On September 26, a Venetian mortar, fired from the Hill of Philopapus, exploded the magazine and the building was partly destroyed. The internal structures were demolished, whatever was left of the roof collapsed, and some of the pillars, particularly on the southern side, were decapitated. The sculptures suffered heavily. Many fell to the ground and souvenirs were later made from their pieces. After this, much of the building fell into disuse and a smaller mosque was erected. By the late eighteenth century, many more Europeans were visiting Athens, and the picturesque ruins of the Parthenon were much drawn and painted, helping to arouse sympathy in Britain and France for Greek independence. In 1801, the British Ambassador at Constantinople, the Earl of Elgin, obtained a firman (permit) from the Sultan to make casts and drawings of the antiquities on the Acropolis, to demolish recent buildings if this was necessary to view the antiquities, and to remove sculptures from them. He took this as permission to collect all the sculptures he could find. He employed local people to detach them from the building itself, a few others he collected from the ground, and some smaller pieces he bought from local people. The detachment of the sculptures caused further irreparable damage to what was left of the building as some of the frieze blocks were sawn in half to lessen their weight for shipment to England. Today these sculptures are in the British Museum, where they are known as the Elgin Marbles or Parthenon Marbles. Other sculptures from the Parthenon are in the Louvre in Paris and in Copenhagen. Most of the remainder are in Athens, in the Acropolis Museum which stands below ground level, a few metres to the south-east of the Parthenon. A few can still be seen on the building itself. The Greek government has been campaigning for many years for the British Museum sculptures to be returned to Greece. The British Museum has steadfastly refused to consider this, and successive British governments have been unwilling to force the Museum to do so (which would require legislation). When independent Greece gained control of Athens in 1832, the visible section of the minaret was removed from the Parthenon and soon all the medieval and Ottoman buildings on the Acropolis removed. The area became a historical precinct controlled by the Greek government. Today it attracts millions of tourists every year, who travel up the path at the western end of the Acropolis, through the restored Propylaea, and up the Panathenaic Way to the Parthenon, which is surrounded by a low fence to prevent damage. 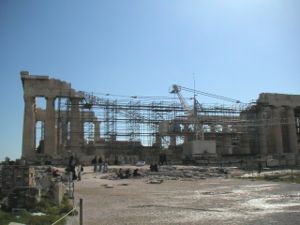 Restoration work on the Parthenon in February 2004. 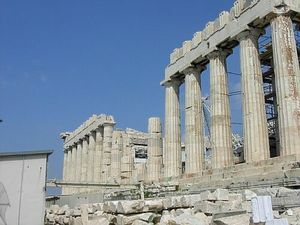 In 1975, the Greek government began a concerted effort to restore the Parthenon and other Acropolis structures. The project later attracted funding and technical assistance from the European Union. An archaeological committee thoroughly documented every artifact remaining on the site, and architects assisted with computer models to determine their original locations. In some cases, prior re-construction was found to be incorrect. Particularly important and fragile sculptures were transferred to the Acropolis Museum. A crane was installed for moving marble blocks; the crane was designed to fold away beneath the roofline when not in use. The incorrect reconstructions were dismantled, and a careful process of restoration began. The Parthenon will not be restored to a pre-1687 state, but the explosion damage will be mitigated as much as possible, and new marble is being used from the original quarry to fill gaps and effect structurally necessary repairs. Ultimately, almost all major pieces of marble will be placed in the structure where they originally would have been, supported as needed by modern materials. Originally, various blocks were held together by elongated iron H pins that were completly coated in lead, which protected the iron from corrosion. Stablizing pins added in the 19th century were not so coated and corroded. Since the corrosion product (rust) is expansive, the expansion caused further damage by cracking the marble. All new metalwork uses titanium, a strong, light, and corrosion resistant material. Since the 1960s, the greatest threats to the Parthenon have been environmental. 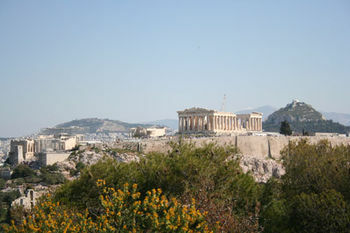 Athens has grown enormously since World War II and has major problems with traffic congestion and air pollution. Corrosion of its marble by acid rain polluted by car exhausts has already caused irreparable damage to some sculptures and threatens the remaining sculptures and the temple itself. 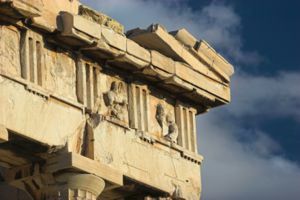 Over the past 20 years, the Greek government and the city of Athens have made some progress on these issues, but the future of the Parthenon is still a matter of some concern. The sculptures that reside in the British Museum are in a noticably better condition to the ones that were left attached (The pediment sculpture of Cecrops that Elgin left and the remaining Caryiatids resemble melted wax after 50 years of modern pollution). This fuels the debate over the Elgin marbles issue.